Vatican officials have confirmed that the Allen organ recently installed in St. Peter's Basilica will be used for the Christmas Eve Mass celebrated there on December 24th at 9:30 PM Rome time (3:30 EST). The service will be broadcast live, worldwide, on EWTN. Allen is thrilled and humbled by this opportunity to support the music ministry of the Vatican. 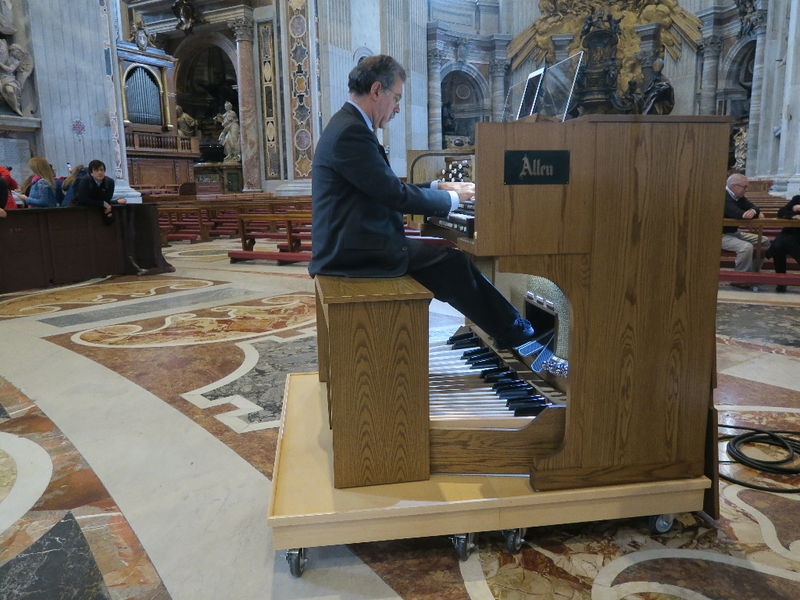 Allen Organ in The Vatican! Last month we announced that Allen Organ Company was chosen to be the exclusive organ of the Sistine Chapel Choir for papal celebrations in St. Peter's Square. 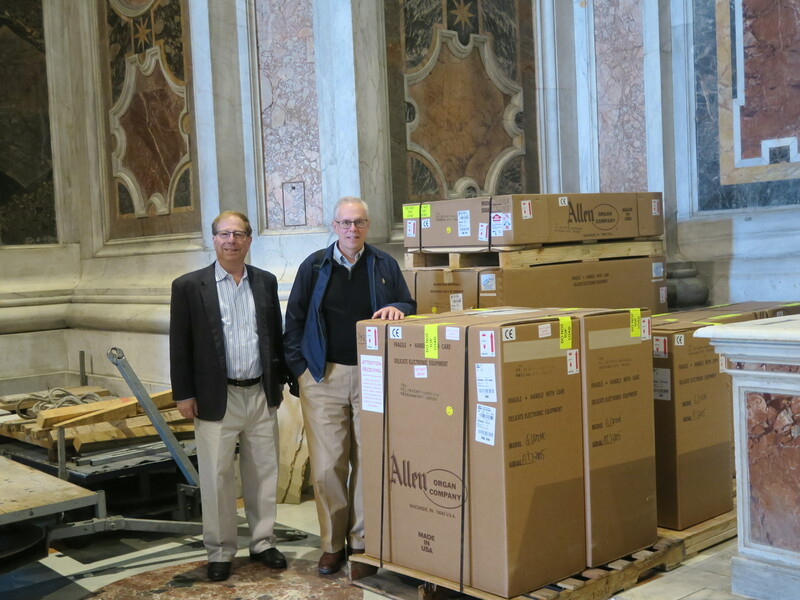 I have since traveled to the Vatican with Allen Vice President Barry Holben and Jean-Philippe Le Trevou (Allen's French representative) to install the three-manual Allen GeniSys Organ. I would like to share details about this unique experience, as well as some exciting news about the increased significance the Allen organ will play at the Vatican. We were initially informed that the organ would be used by the Sistine Chapel Choir. 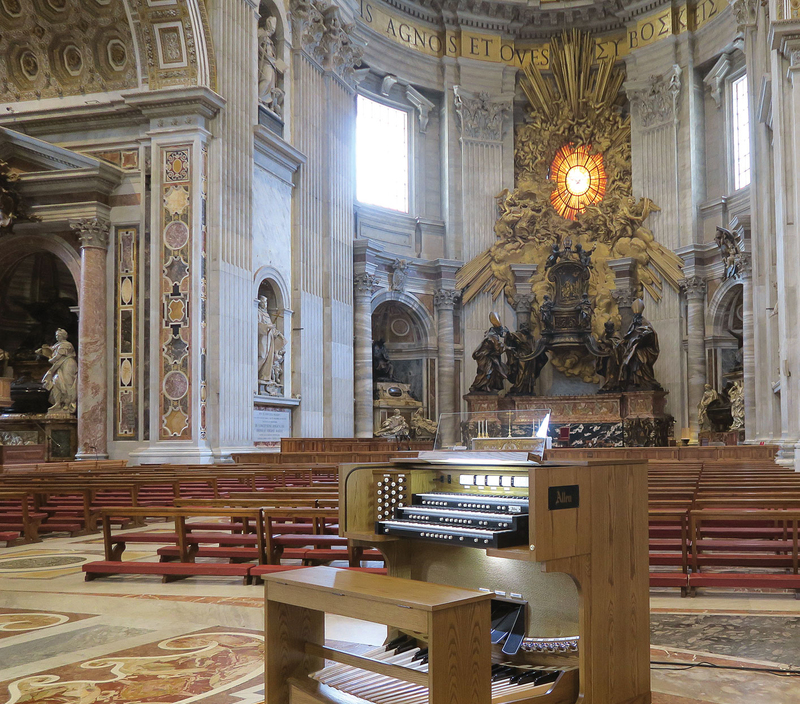 During our visit we learned that the Vatican wanted the organ to also be used for musical requirements at St. Peter's Basilica itself. What an exciting turn of events. Fortunately we designed the organ with a flexible audio system that could allow for the expanded requirement. Upon arrival we were met at a gate to the Vatican and taken directly to the Basilica. We were pleasantly surprised to find the organ crates near where the Basilica's Choir is located. After uncrating the organ we spent hours setting it up. Late in the morning Monsignor Massimo Palombella, Maestro of the Sistine Chapel Choir and responsible for the Basilica's overall music, came to preview the organ. His positive response led to a remarkable tum of events. 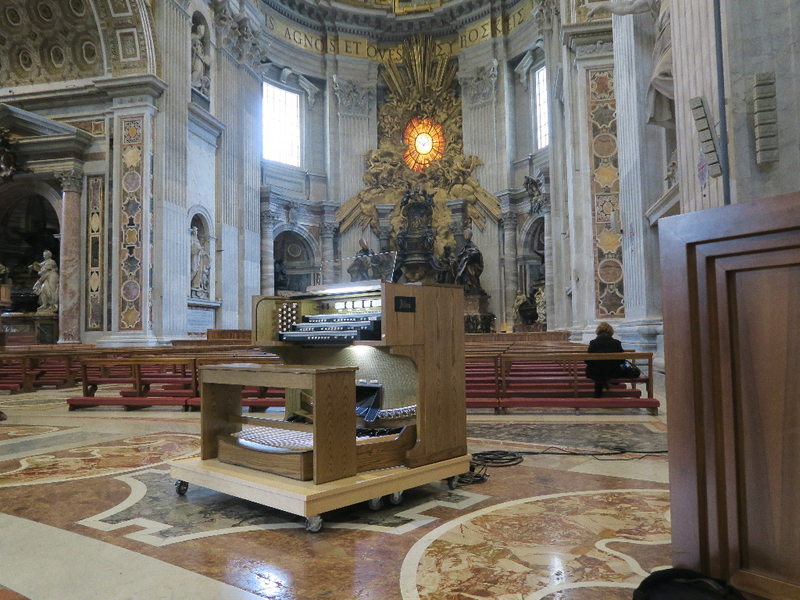 We were informed that on the following day the organ would be tested in the Basilica for broader usage. 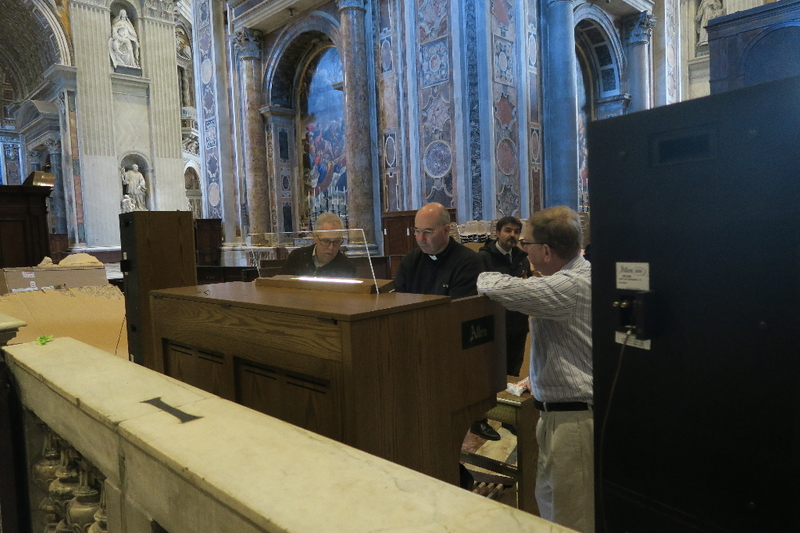 It was fortuitous that the organ's audio system included external speaker cabinets and Audio Outs with the ability to connect the instrument to the Basilica's PA system, something we prepared for as we initially understood the organ was to be used in St. Peter's Square. Thursday morning we started preparing the organ for the test. The instrument's speaker cabinets were moved on their custom dollies behind the Choir in a way that would allow the organ's sound to reflect up into the Basilica. We then connected the Audio Outs to the Basilica's PA system and waited for 3:00. During this time period Juan Paradell-Sole, organist of the Pope, came for his introduction to the organ. His response was positive. We spent part of the two-hour Basilica lunch period, 12:00 to 2:00PM, working with Juan Paradell-Sole and were nearly alone in St. Peter's. This was a remarkable and once-in-a-lifetime experience! At 3:00PM, Maestro Palombella, organist Juan Paradell-Solé, and the Basilica's sound manager arrived. We connected the sound system to the organ and did additional voicing. The organ was then heard throughout the Basilica and it did not take long to see smiles from the three "judges". Maestro Palombella then informed us that the Allen organ would first be used in the Basilica during the following week. It is not possible to put into words our excitement at that moment. There were many side-discussions that occurred during these amazing two days. One related to the Basilica's pipe organ, an instrument with pipe's speaking on both sides of the Nave. It was evident that this organ is not well received and does not adequately serve the Basilica's music ministry. Issues include tuning, as well as an inability to properly mix and coordinate the organ's sound throughout the Basilica. We were also privileged to be invited by Maestro Palombella for a full rehearsal of the Sistine Chapel Choir at the Sistine Chapel itself. We were treated to not only a tremendous musical event, but also able to view the works of Michelangelo and others. Allen organs have been installed in many prestigious institutions over the years. Now, being able to place the Vatican at the top of this list is amazing and humbling. On a more personal note, the first Allen church organ installed by my father was in a small parish church in Allentown. The church grew and ultimately became the Cathedral of the Allentown Diocese that now houses a large Allen organ. The Company has come a long way. 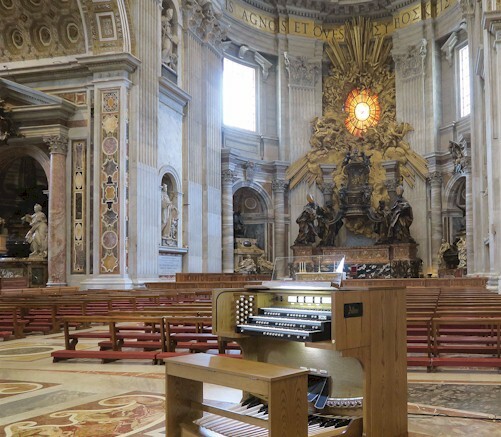 As I reflect on the amazing story of how an Allen organ has become a part of St. Peter's Basilica, I find the need to consider decades of efforts by too many to mention. Thousands of Allen employees over the decades played roles in producing the highest quality products. Our engineers created advanced platforms that enable the organs to be voiced to the most exacting and artistic requirements. Our dealers made and maintain organ installations that insure customer satisfaction. And, it was a dealer rental in Detroit just a few months ago that resulted in Maestro Palombella becoming excited about the possibility of an Allen organ in the Vatican. In closing, I offer a huge "thank you" and congratulations to all involved in the thousands of efforts and events over the years that led to this amazing story. Allen Organ Employee Celebrates 60th Anniversary with Company! 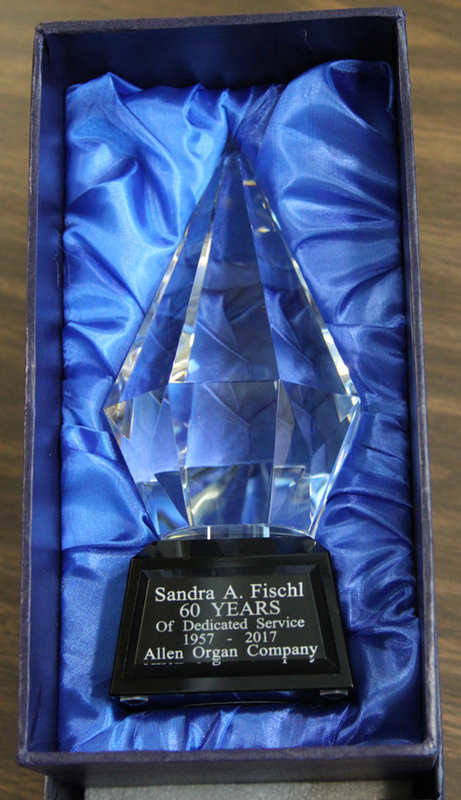 Sandra Fischl celebrates her 60th Year at Allen Organ! WFMZ-TV69 Local TV - click here to watch more about this remarkable story! 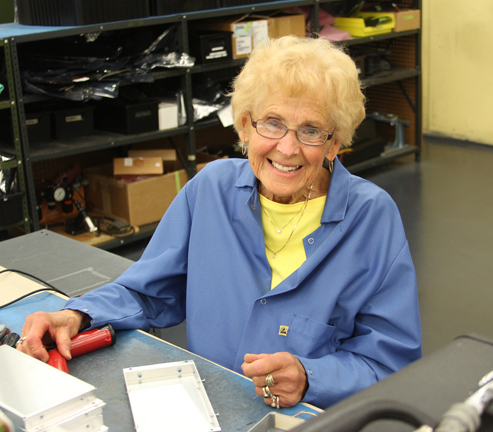 Lehigh Valley Business - click here to read more about Sandra Fischl's 60 years at Allen Organ! 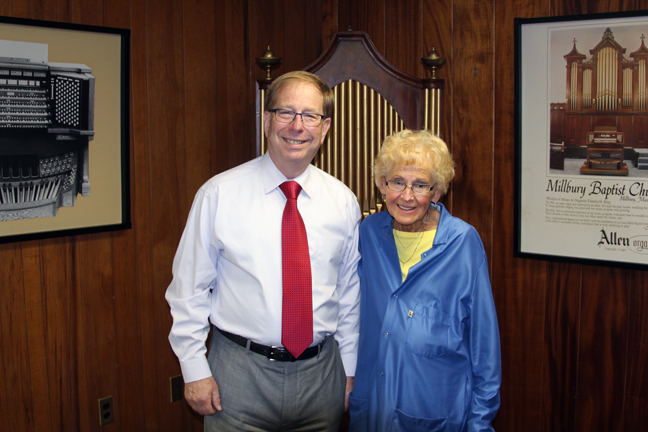 Allen Organ President Steve Markowitz congratulates Allen's first 60 Year Anniversary employee Sandra Fischl.